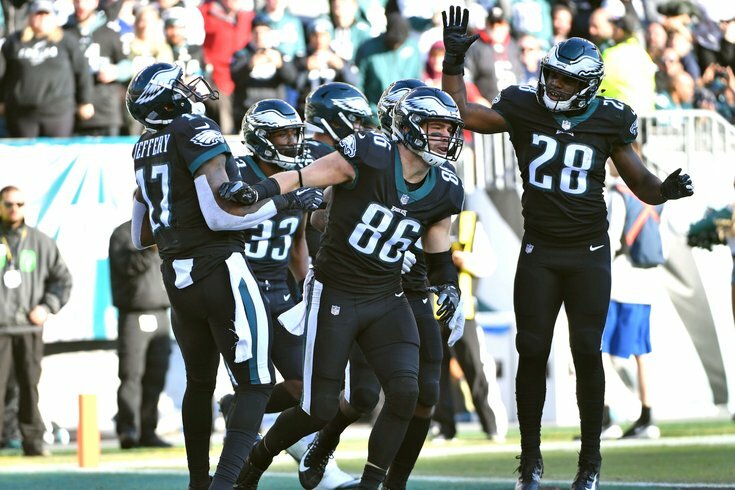 Philadelphia Eagles tight end Zach Ertz celebrates his touchdown catch with teammates against the New York Giants during the second quarter. Coming off two straight ugly losses against the Dallas Cowboys and the New Orleans Saints, the Philadelphia Eagles desperately need a win over a team they've dominated in recent years, the New York Giants. As usual, the Eagles are banged up heading into Sunday. Most notably, the Birds will be without their top four cornerbacks, so Jim Schwartz will have to figure out a way to defend Odell Beckham and the Giants' offense with practice squad-level players. The Giants, meanwhile, listed one non-factor on their final Friday injury report. That's it -- one guy. As we noted in our five matchups to watch, in addition to finding a way to stop Beckham, the Eagles' suddenly bad run defense will also need to limit running back Saquon Barkley, which is something they struggled to do during the Eagles and Giants' Week 6 game. It is imperative that the front four causes disruption in the backfield to take some pressure off the back seven. The line on this game opened with the Eagles being 6-point favorites, but that has since fallen to 5. There is ample reason to believe the Eagles could lose at home to a 3-7 team today. Here are our staff writer picks, as well as who other publications are picking. For the gambling degenerates, you can find our Week 12 NFL picks here.